Following on from his pincer-sharp adult fairy tale The Lobster (2015), Lanthimos’ The Killing of a Sacred Deer is a more menacing beast. The characters share the same stilted, unnatural delivery of dialogue, taking us back into a similarly odd realm of heightened, hyperreal allegory. But we’re on a darker, more disconcerting trip. Multiple long corridors stretch off into the distance throughout. The cumulative effect is the feeling that they might be receding into the deepest reaches of Lanthimos’ psyche, always just beyond reach. 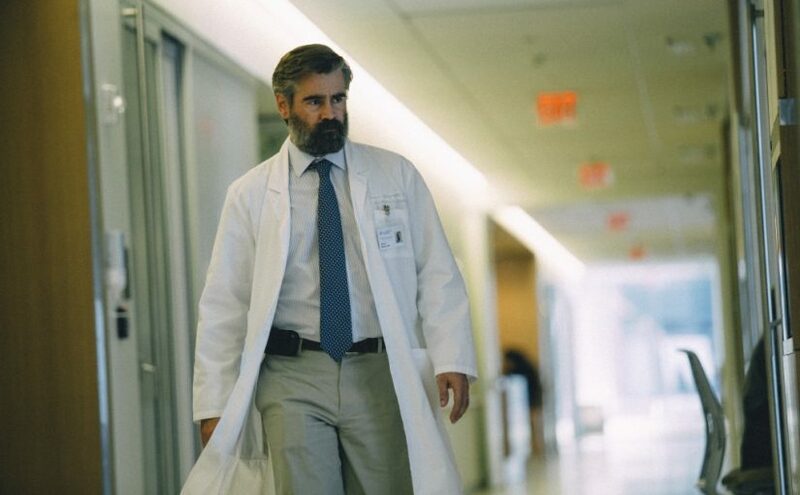 Colin Farrell is Steven Murphy, renowned surgeon, endlessly pacing these pristine interior walkways of some Stateside, state-of-the-art hospital. After a heart-pounding opening, Farrell’s idle small talk with a colleague sets the uneasy mood. They’re going into a banal level of detail about the water-resistant properties of their wristwatches, in characteristically passionless tone. Conversation over and it’s back to Murphy’s mundane workaday routine of saving lives, with anaesthetised punctuality, ever on schedule. Outside the walls and duties of the hospital, he’s regularly hooking up with a teenager. Young Martin is awkward, wary but precocious, a touch too assertive. Farrell enquires after his well-being. He buys him gifts (a water-resistant wristwatch, what else?). The kid is invited over to meet his children, and wife, a demure Nicole Kidman. They’re the very picture of the archetypal middle-class family. Naturally, the offer is returned, and the esteemed medic joins the young buck and his mother for dinner, in a blackest-comedy cameo that sees Alicia Silverstone’s return to the big screen. But the pervading air of weird unease persists, despite (actually, because of) everybody’s overly polite interactions. When it becomes clear that Steven is vainly trying to fill in some sort of custodial, fatherly role, the boy’s malignant hold over the surgeon and his family is exposed. And begins its steady, abnormal growth. Events take place in a universe that is not quite our own, one foot just outside of reality. The Lobster’s bizarre regulations excelled within the detached confines of its ‘hotel’ setting. Here, the haunting impact is strengthened by sailing so dangerously close to the winds of real life. Kidman and Farrell make a most compelling central couple, reunited so soon after locking horns in Sofia Coppola’s The Beguiled (2017). Successful, highly thought of, raising two virtuous, principled children, but beneath the surface, competitive, distant, in a rut. Amongst the U.S. setting, Farrell’s pleasing Irish drawl emphasises the character’s shellfish-out-of-water predicament. Kidman’s forthright decency would appear to go deeper than her husband’s, but she too is willing to venture to the darkest recesses if necessary. But it’s Barry Keoghan (Dunkirk, 2017, ’71, 2014) who is the revelation. As arduous adolescent Martin, he conjures up the queasy sense that something just ain’t right from his first moment, with seemingly no effort. This is a film that is deliberately poised to ask questions, not to answer them. As the family’s plight creeps towards its inescapable conclusion, the premise is a contemplation of how the eternal themes of responsibility, justice, control, and regret must be negotiated around the complexities of modern life. This disquieting fable takes time to fully digest, then installs itself in the memory with the unsettling persistence of an all-too-realistic nightmare. It’s a slow-release and powerful morality tale that hits fresh horror notes in highly individualistic style. The revolving trauma of the ending coda, and the ideas it forces you to round on and confront, will be difficult to shake off.